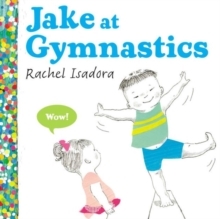 Caldecott Honor winner Rachel Isadora's irresistible illustrations of enthusiastic toddlers will have budding gymnasts jumping for joy. Jake and his diverse group of friend love their action-packed gymnastics class, where they stretch, tumble, balance, turn somersaults and so much more. This is the perfect book to introduce toddlers to the joy of movement and the fun of gymnastics.